Winplex analysis software wind data statistics output example・We use collected raw wind measurement data to determine basic wind statistical quantities such as mean wind speed, wind direction and turbulence level. ・Site estimation validity conformity is checked with IEC61400-1 standard by using NEDO guidlines published at 2008. Annual mean wind speed given for each direction sector. Weibull distribution (for wind speed total and for each direction sector). Turbulence Intesity (for wind speed total and for each direction sector). Check and confirmation of the measured data with the neighbouring government measurements with possibility of micro-climate revision. 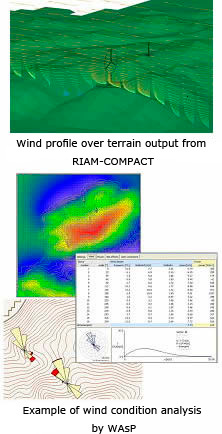 Wind climate analysis is performed by using state-of-the-art software such as RIAM-COMPACT and WAsP. ・Result of cooperation between Riam Compact Inc. company and Kyushu University. ・Deploys LES model to solve non-linear and non-stationary wind flow over terrain. ・Wind flow intensity and profile visualization. ・Prediction of turbulence level over a complex terrain. ・Local climate prediction model developed by NEDO. ・By using a multistage nesting routine, model can predict mean wind speed on compex terrain with high accuracy. ・Software implements k-ε turbulence model. 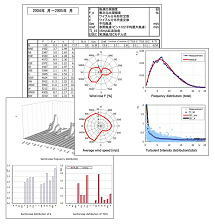 ・Developed by Risoe Institute, it is used for predicting wind climate. ・Wind turbine/farm power production prediction. ・In the case of wind farms, wake loss influence effect is included. By using FAST aeroelastic code, we perform ultimate and fatigue load case analysis of the wind turbine in compliance with IEC-61400-1 International Standard for wind turbine design. 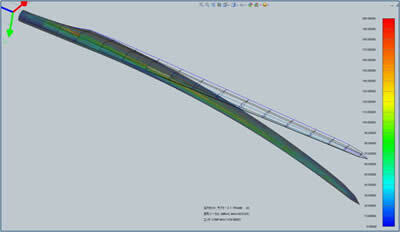 In addition, it is possible to use FAST aeroelastic code to analyze aerodynamic noise generated by wind turbine blades. NASTRAN stress level map output of the 5MW wind turbine blade during the ultimate load By using NASTRAN FEM model, we analyize ultimate and fatigue load cases on wind turbine blade in accordance with IEC-61400-1 International Standard for wind turbine design.